Heavy Duty Folder Made in Finland! This knife fairly screams, "Quality! Quality! Quality!" Marttiini is a Finnish firm that has been crafting superb knives since 1928. Both their knifemaking skills and authentic Finnish designs are outstanding! For people in the arctic regions, e.g. 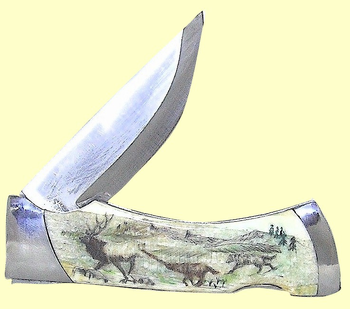 the Finns, a knife has always been an important means of survival in harsh conditions. Knives were necessity in collecting firewood and making a fire, making tools and implements, construction, hunting, fishing and preparing the kill for cooking and eating. Marttiini knife factory has a long tradition in combining handicraft skills and practical needs. This substantial, heavy duty folder (4 7/8 inches closed) has a 3 1/2 inch stainless steel blade which is hollow ground and with a mirror finish! It measures 57-58 on the HRC (hardness scale). It weighs 6.3 oz (180 gms). This knife is all stainless - including the gracefully curved bolsters. The handle is shaped with a finger grip, and takes a long (4 inch) piece of fossil ivory. This knife is equally at home on your belt in the wild, or in a collector's exhibit case! Comes with either a leather belt sheath or a soft zippered collector's pouch. Shown with Fossil Walrus Ivory - Light, with wildlife scene. (If you like, you may buy this very knife! Click on picture for larger image.) As an option, we will scrimshaw an etching of any animal, a ship of your choice, or your own boat (sail or power)on one side - Just email or snailmail us a picture, or let us draft one for you.